A weekend landslide buried a key road access tunnel to Freeport-McMoRan Copper & Gold Inc's Grasberg mine in Papua, Indonesia, leaving thousands of workers stranded, but a company spokesman said operations were continuing as normal. 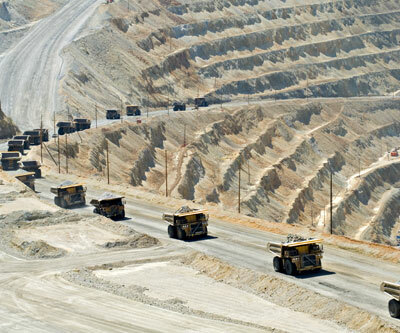 Freeport is the world's largest publicly traded copper miner, while Grasberg has the world's largest recoverable reserves of copper and the largest gold reserves. Saturday's landslide prevented thousands of workers from reaching the mine, situated in the highlands of eastern Papua province, but a helicopter was seen ferrying some staff before cloud and mist descended. About 60 buses used to transport workers were parked in the lowlands, below the blocked tunnel. "There was ground failure at Hannekam Tunnel on March 5. The tunnel is currently closed while work is completed to address the failure," spokesman PT Freeport Indonesia spokesman Ramdani Sirait said in an emailed statement. "This ground failure occurred outside PT Freeport Indonesia's mining area and production continues normally," he added.